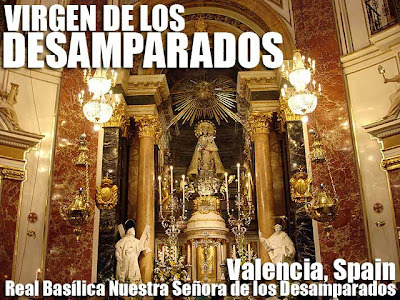 Every second Sunday of May, Valencia comes alive with the feast of the Nuestra Señora de los Desamparados. Our stay coincided with the big celebration, most of which are centered in the Plaza de la Virgen. 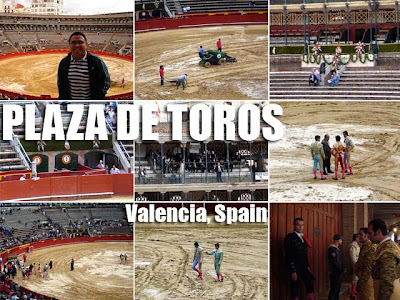 It would have been a really great event with religous festivities and bullfights scheduled. But it was raining. And it never rains during the fiesta! Is this global warming at work? It was good though that some major events still pushed through. Festivities usually begin the night before the fiesta or the visperas. The bullfight or corrida I was supposed to watch in the afternoon was canceled even if it was not raining since the ground was too soft and therefore not safe for the matadors. In fact, the matadors were all dressed for the event. So I then proceeded to the Cathedral to check out the festivities. And I got to attend a Mass celebrated by His Eminence Agustín Cardinal García-Gasco y Vicente, Archbishop of Valencia. It was good the weather cooperated up until the evening events were completed. 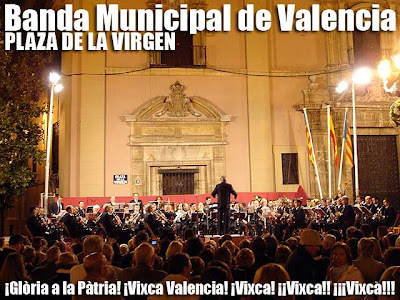 The program at the Plaza de la Virgen started with a concert by the Banda Municipal de Valencia. As soon as the bells of the Miguelete signaled 11 p.m. the band played various classical songs from Spain. What struck me was the strong patriotism of the crowd when the band played the patriotic songs. As soon as they heard the first notes, the crowd erupted in applause, some were even teary-eyed. You could see people silently singing together with the orchestra. I wonder when Filipinos will react the same way upon hearing Pilipinas Kong Mahal or Bayan Ko being played. Let's admit it, many young Filipinos today even consider singing patriotic songs corney in fact! I hope that changes. For the last song, the conductor faced the crowd and everyone started singing with fervor the Himno de Valencia. As the last part of the song was sung, you could feel the power of the crowd: "¡Glòria a la Pàtria! 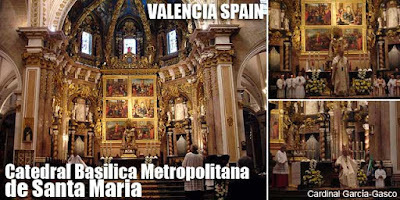 ¡Vixca Valencia! ¡Vixca! ¡¡Vixca!! ¡¡¡Vixca!!!" Indeed, it was a spectacle we should learn from. The concert ended at exactly midnight as the bells of the Miguelete tolled anew. 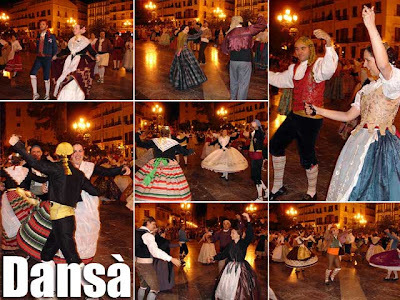 The Dansà followed with dozens of locals in intricate regional costumes. 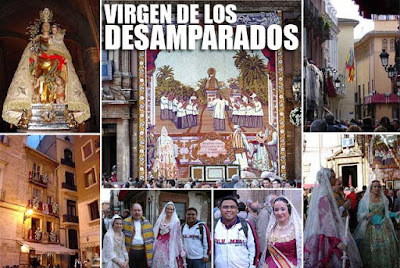 Just like the Philippines where many cities used to dance the rigodon de honor the night before a fiesta, the Dansà is performed for the same reason, in honor of the feast of the Virgen de los Desamparados. It was great we got a good position to watch the performance. And I captured some videos using my Sony Ericsson K850i camera phone. The next day, I was supposed to attend the morning events at the Plaza de la Virgen. But it was still raining. So I was content with watching the festivities on TV. After the morning Mass, the Virgen de los Desamparados is transferred from the Basilica to the Cathedral in a fervent procession called the Translado. It was heart-warming to see the faithful raised on the shoulders of other people in impromptu bursts of poetic praises to the virgin. The image is brought out in a Quiapo-like procession, showered by a deluge of petals from the buildings as it passes by. But what is peculiar about the Translado is that it's women and children trying to touch the image. It scared me seeing parents pushing their babies and young children, screaming and crying, in order for them to touch the image during the morning procession. Early in the evening, a grand procession is held. The streets of Valencia were decorated for the grand event with symbolic banners hanging from balconies and flower ornaments to match. 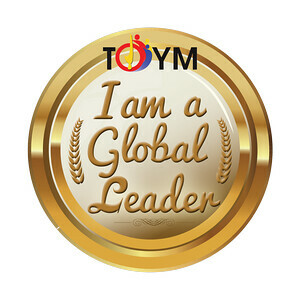 It would also have been a great opportunity to witness the intricate fiesta costumes of Valencia. But the procession was canceled at the last minute since the archbishop was afraid it would rain. But ironically, it didn't rain! It's a pity since all the falladoras were all dressed-up in lavish gowns for the procession. Update: The procession pushed through the week after. But sadly, we were already in Barcelona by then. The video above is from YouTube.